Bay Mills Casino and Resort in Brimley, Michigan not only offers two casinos, 142 hotel rooms, four restaurants, 114 RV sites, and a championship 18-hole golf course, but also is extending its summer rates for its five-tee-set course into September, 2018. Players who venture to the Upper Peninsula to explore the layout can take advantage of the $30 same-day replay, the twilight rate of $45 for 18 holes with a cart, or $25 for nine holes with a cart. The regular rate in the summer is approximately $75 for an 18-hole-round, with carts featuring GPS monitors to aid golfers. Group rates are also available. 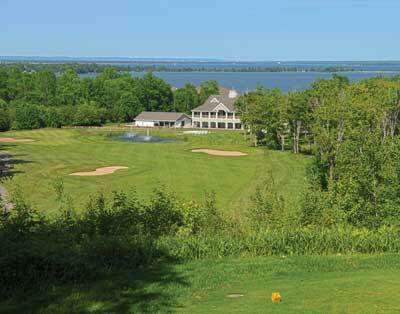 The 18-hole course, known as Wild Bluff, measures about 7,100 yards from the back tee position and roughly 5,300 yards from the front tee along the bluff and wild of the Lake Superior shoreline. Designed by Mike Husby, Michigan architect, Wild Bluff incorporates playable and challenging golf features, such as spacious fairways and greens, while also incorporating casino themes. Husby noted at the course’s grand opening he tried to build something for those who like action—staying all day to play a bunch of holes and hitting the casino at night. PGA Canada also had a four-year run as a tournament stop at the course and Michelle Wie, LPGA professional, made national news taking on the men in that event. With its practice facility comprising double tweed driving range, expansive chipping area, and two putting greens paired with 18-hole course elevation changes and stunning views of the lake and wildlife, Wild Bluff is a northern destination. The Wild Bluff Golf Course is also hosting a number of events through the end of the season, such as the UP Ladies Scramble on July 23, 2018, which is a four-person scramble, shotgun start; the Boys and Girls Club Scramble on September 21, 2018; and the Snowball Open on October 13 and October 14, 2018. Wild Bluff Golf Course is managed by Matthew Phipps, director of golf; and Larry Buchholtz III, superintendent.